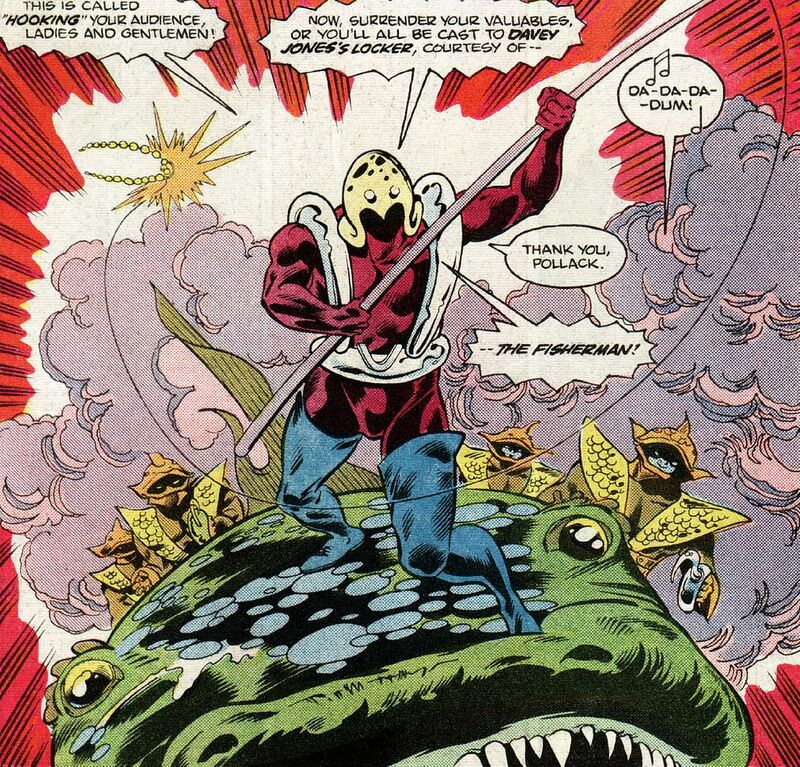 HomeSpecial FeaturesThe Top Ten Aquaman Villains!! It must be done. A list so awesome that you should read the thing twice. Aquaman has suffered the brunt of many many jokes over the years. He’s the man who can talk to fish. I’m not in the opinion that impression is the best for the King of the Seven Seas. Remember the planet is covered in 71% of water. He rules all of that or has tried to maintain his dominion. Aquaman is like any superhero though. He has some villains for the ages. With the new movie currently in theaters, let’s look at some of the bad guys and girls that have burdened his empire. Special Note: The Family Guy is not on this list. There was a request…sigh…Enjoy! 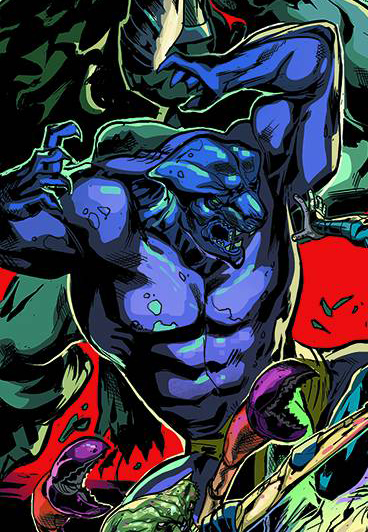 There is indeed a character in the comics that uses and giant hook to capture his prey. This happens to be one of Aquaman’s more absurd villains. Seriously, though the character uses high tech gear to steal priceless items and scientific inventions. His yellow headgear is an alien symbiote that uses telepathy to place fear into it’s enemies. Because of the alien the Fisherman has been many different people as the alien has moved from host to host. Having gimmicky lures to go after his prize also helps. He caused mischief more recently in the Identity Crisis series. Who are the Ocean Lords? It was the question that DC drop when they released Drowned Earth last month. The Ocean Lords consist of Fleet Admiral Tyde, Captain Gall, Commander Drogue and The Flood. Think…these are the old gods of Atlantis. Originally disposed of by Poseidon. These gods were released by the Legion of Doom. You have to think…why add these guys to your list? They just appeared. They also stripped Aquaman of his powers and flooded the Earth. His powers were transferred to Black Manta. Manta hadn’t realized how powerful Aquaman happens to be. It was a revelation to us all. The flooding caused the planets inhabitants to turn into sea monsters. It was very hard to see some of our DC supporting character change. 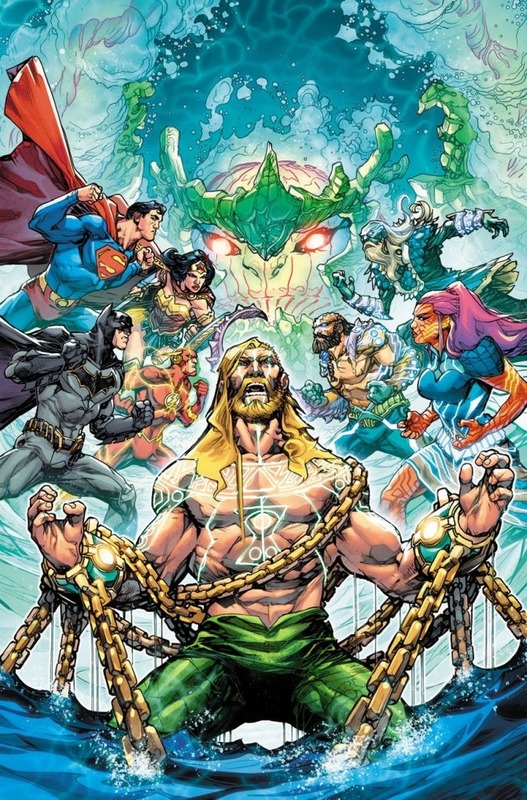 The Ocean Lords have had a great start and have some serious potential of causing Aquaman trouble beyond the Drowned Earth pages. The story was decent with exception of some of the tie-in books that I did care for or find memorable. After the DC Universe was restarted in the NEW 52, Rebirth came about. With it came Atlantean eco-terrorists called the Deluge. Corum was a part of a lower form of Atlantean society which built the foundations of Atlantis itself. 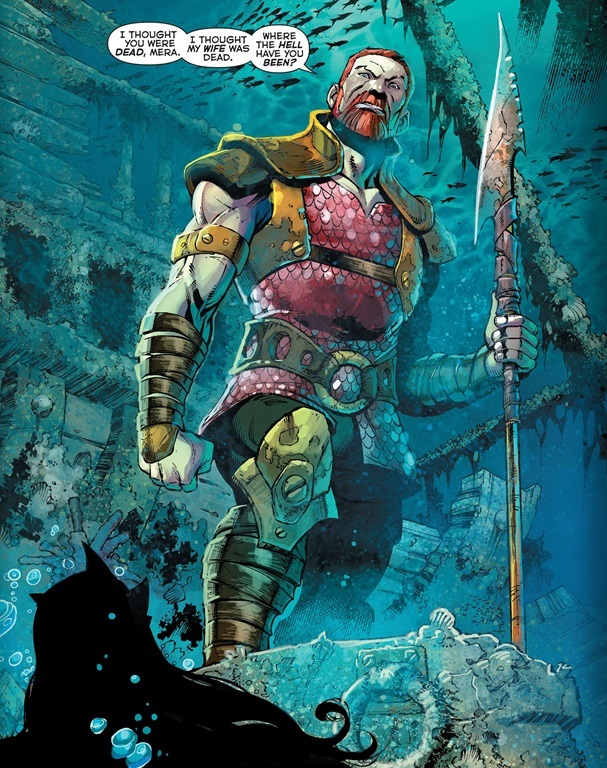 Corum Rath rose up and defeated the monarch(Aquaman) of Atlantis. Corum also has a deep hatred of the surface work. While his rule was shorted by Arthur the ramifications will be felt for years to come. There are the “Seven Seas” in the oceans hence seven kingdoms. The king of Xebel happens to be Nereus who happens to be the ex-fiance of Mera. Mera happens to be the Queen of Atlantis and the wife of Aquaman. Hopefully you can see the conflict here. His primary goal was to free Xebel from the imprisonment that Atlantis had placed upon their kingdom during one of the great wars. 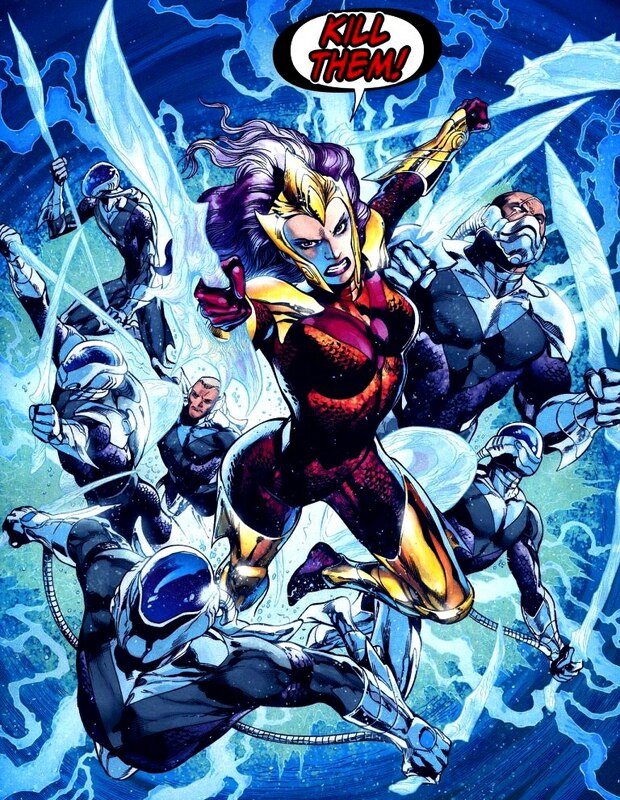 Mera also hailed from Xebel as well and her story is tied to Nereus quite well. Dolph Lundgren plays Nereus extremely well in the Aquaman movie, even though his origins are altered for the movie. There’s nothing like family to make things interesting. Aquaman’s wife Mera has a twin sister by the name Hila. Mera sister was part of an assassination group that was trained to kill Aquaman. She uses her hydrokinesis to create water knives as weapons. This character has potential to do some serious damage upon the Aqua-family. It would be interest to see if the movies could pull off a team between her and Ocean Master. Charybdis and his wife Scylla were international terrorists who tried to kill Aquaman. Scylla was killed which drove Charybdis mad. He continued to fight Aquaman by suppressing his powers and eventually stealing them. His failed attempted to talk to fish cause to almost be killed by piranhas. He ended up taking on the traits of the piranhas and becoming Piranha Man. This eventually led to Aquaman losing his hand to a piranha attack. Just imagine sharks being merged into a humanoid form and having a bigger appetite. The Trench were a faction of the Seven Seas who’s land was dropped in the deepest darkest trench of the planet. Totally mindless creature that were simply horrifying on the page. 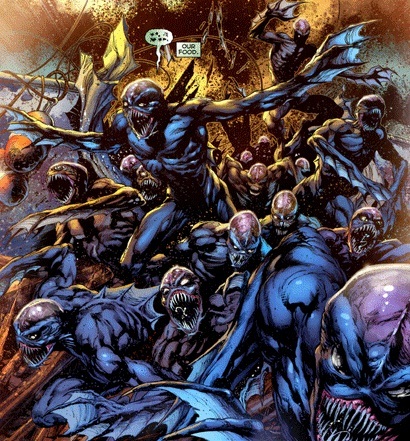 They are perfectly represented in the Aquaman film with ghastly horror. Eventually their presence will be felt among the DC Universe. When your king of the sea, your eventually going to have some fish that don’t really agree with you. King Shark actually started his battles in Superboy. He worked as an enforcer for the Hawaiian mafia. He actually became more of a weird sidekick to Aquaman only caving to his more shark instincts. The character is more of a thug and has taken battle damage from time to time. The character has actually been seen on the Flash TV show from time to time. Like I said before family can be a pain. 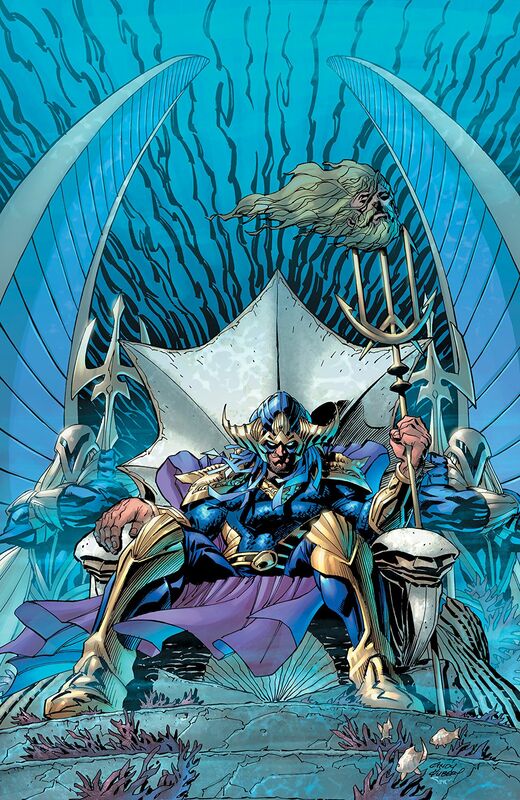 Orm Marius or the Ocean Master is the evil half brother to Aquaman. He primary goal is to take over Atlantis and destroy the surface world. Clearly this guy has a beef with everything above the water. It’s not Arthur’s fault that he’s half human/half Atlantian. The truth be told prior to The Crisis of Infinite Earths Orm was the son of Arthur’s human father. He simply became a high tech thief and created all kinds of grief for Aquaman. His super villainy was more Aquaman fighting a costumed creep sort of thing. 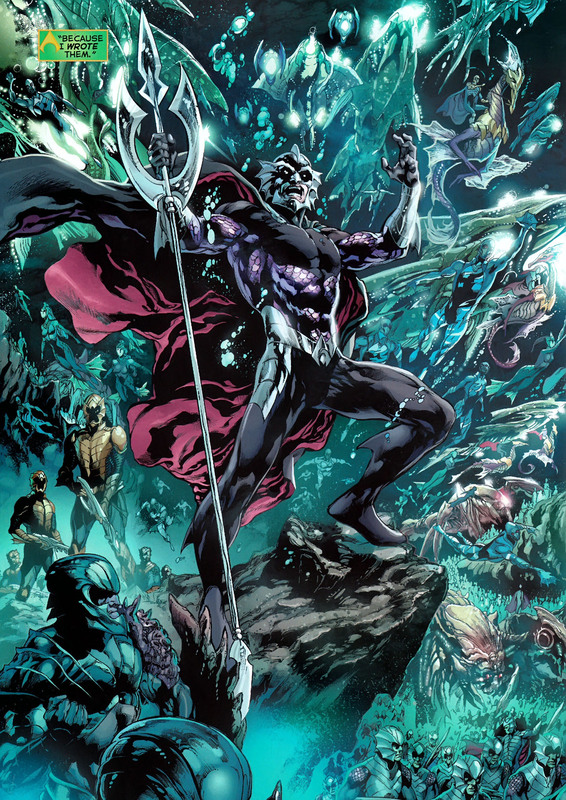 The post-Crisis DC Universe depicts Ocean Master as we’ve seen him in the current film(little spoiler), but they tell his back story through out the movie anyway. The character has a constant villain in just about every incarnation of Aquaman’s world aside from our number 1 villain. 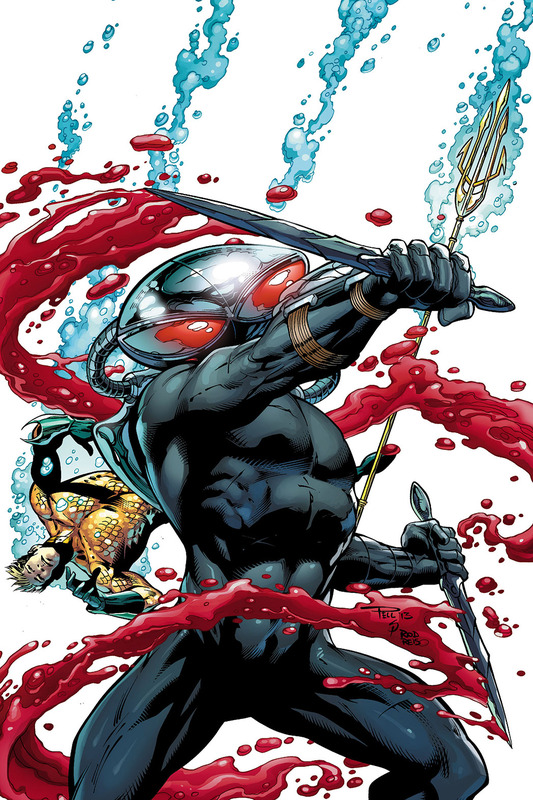 Black Manta is probably one of the most recognizable character in any form of Aquaman media. The black wet suit and giant red eyes are simply terrifying the average person. 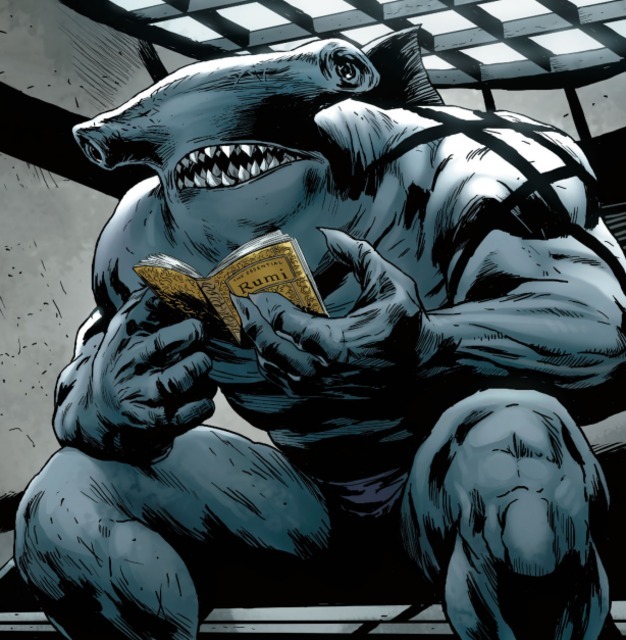 David Hyde(Manta) has had several different origin stories that create this hateful arch enemy of Aquaman. It best to know that Hyde is vicious mercenary that has it out for Aquaman for possibly not helping him as a small child. Hyde is a black man under the black armor and the brother holds a grudge like nobody’s business. He made it more so more personal when he murdered Aquaman’s son Arthur JR. He is a villain to the core that will even murder his own lackeys if they fail his orders. Black Manta will appear in the new Aquaman movie.